Educators from across California provided emotional testimony at a Feb. 6 hearing about the impact of recent wildfires on schools and communities. In what several speakers called the “new normal” due to climate change and a now year-round fire season, firestorms have caused unprecedented damage to school districts statewide since 2017. The State Assembly’s Education Committee met at the Capitol to assess the recovery process, what more needs to be done, and how to prepare for future fires and other disasters. 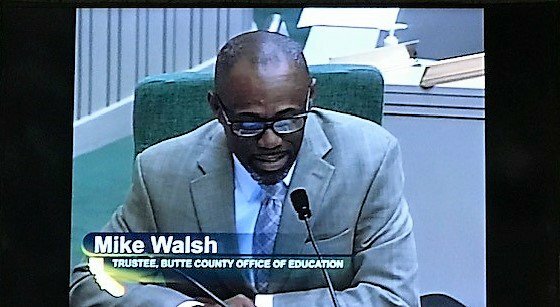 Staff, administrators and teachers from those communities, stretching from Montecito to Santa Rosa to Butte County, shared their experiences at the hearing to help with that process. From mental health services to budgets, the devastation and displacement have been costly both socio-emotionally and financially to school communities, the panelists said. Several speakers highlighted the need for funds to hire more trauma counselors to help students and staff process the events. David Smith, a teacher in Paradise Unified School District, for example, shared before and after pictures of his destroyed school building and described students (who now attend school in retail outlets) still unnerved by certain noises and environments. Zoe Miller, a teacher from Santa Rosa City Schools, said her only possessions were those left in her classroom after she lost her home in the fall of 2017. It took months for her and many colleagues to feel fully ready to teach again, she said. The financial damage from the past two years’ wildfires has been substantial as well. Many schools lost funding tied to average daily attendance as enrollment declined or fluctuated. Costs also increased as displaced students suddenly had to be transported long distances to attend class. Meanwhile, districts such as Paradise USD had school buses destroyed by fires. Schools also absorbed unexpected costs from educating, sheltering and feeding students from other campuses. Educationally, students lost instruction time due to school closures and missed days. Amy Alzina, superintendent/principal of Cold Spring School District near Santa Barbara, estimated her students missed about 10 percent of the academic year due to fires and subsequent landslides. Elsewhere, school districts far from the blazes still closed or cancelled outdoor recess and athletics due to smoky air. Academic counselors too pivoted from advising students on coursework to helping them find housing and other services. How best to respond to these challenges in the event of future emergencies is an open question. Adding to the issue, many school leaders are not trained in crisis response and assessing safety thresholds for opening schools. “Educators are [suddenly] expected to act as public health experts,” Steven Herrington, Sonoma County Superintendent of Schools, said of the current system. That system does not have established standards or scientific consensus on safe air quality following toxic smoke, or campus safety and cleanup due to ash and other debris. Even smaller issues such as the effectiveness of face masks protecting from smoke are unsettled. Allowing for Field Act flexibility to allow schools to more easily relocate to temporary facilities. The California Department of Education Emergency Services unit is devoted to crisis response and recovery. They are eager to receive any and all information related to impacts on schools such as damage, access issues and more. Please provide reports and updates to: emergencyservices@cde.ca.gov. California Department of Education funding waivers and recovery: The CDE posted a notice reminding impacted local educational agencies to apply for a waiver to prevent them from losing Local Control Funding Formula funding based on attendance and state instructional time penalties. The approval of school closures and decreases in attendance may be requested by submitting a Form J-13A. More information about state recovery resources is available from the CDE’s School Disaster Recovery web page, and at this CalOES web page Impacted school or local education agencies can contact EmergencyServices@cde.ca.gov to connect with the CDE team. Air quality monitoring: The U.S. Environmental Protection Agency’s AirNow California website provides a list of cities, their current conditions and forecasts to monitor for recess, physical education classes and other outdoor activities at school. Several school districts have shut down due to the smoky air. Fire response and recovery: The California Environmental Protection Agency provides a library on air quality, debris and ash removal, and water quality monitoring.